For locations of beaches, lakes, parks, and Recreation Areas refer to the Campground Listings in this Guide and detailed Map inside back cover. LEGEND > Inidicates campground has an advertisement. - Most campgrounds have firepits, picnic tables and shaded/wooded sites. - This campground guide also includes Trail & Recreation information. - Rates, services and phone numbers listed are subject to change. From feasting on rainbow trout to trophy fishing on the lakes or the North Saskatchewan River for Alberta Sturgeonâ&#x20AC;&#x201C;you are sure to experience fantastic fishing in the region. Up to 10 species of fish await your hook in over 100 lakes, ponds and rivers in the area, many of which are great in both summer and winter. While on your paddling adventure soak in the spectacular scenery of the regionâ&#x20AC;&#x2122;s lakes and rivers. Enjoy canoeing, kayaking and tubing at various locations including the North Saskatchewan River, Battle River, Vermilion River and Beaver River. Astotin Lake in Elk Island National Park is very popular with canoe, kayak and SUP rentals available. Lakeland Provincial Park in Lac La Biche region, offers the only canoe circuit in Alberta. The 38 kilometre paddle is an exceptional experience. When portaging between the seven lakes, use the canoe carts available to add to the ease and enjoyment. Albertaâ&#x20AC;&#x2122;s Iron Horse Trail (278 km) is a part of the Trans Canada Trail. This uninterrupted corridor of abandoned CN Rail Line welcomes all types of trail users. ATVs and snowmobiles are very popular on this trail. The western branch starts in Waskatenau, the eastern branch starts in Heinsburg, and the northern branch heads to Cold Lake. (See ad page 51). North Bruderheim Provincial Recreation Area (14 km), just north of Bruderheim and east of Highway 830 along Twp Rd 565, is a designated OHV/ATV recreation area. However, please note that OHV use is not permitted on roads or road right-of-ways in this provincial recreation area. Redwater Sandhills Provincial Recreation Area (100 km) - The Sandhills Area boasts one of the largest sand dune fields in the region, and can be found only five minutes east of Redwater on Twp Rd. 574. The area contains numerous designated looping trails and is used extensively by ATV and snowmobile riders. 1 mile from Long Lake Provincial Park. 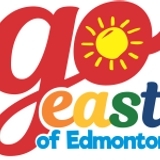 East of Edmonton there are over 20 National and Provincial Parks and Recreation Areas with trails. In addition, there are numerous other trails at campgrounds and other designated natural areas to enjoy. In total, there are over 1000 km of trails at over 50 locations across the region. Refer to the Campground Listings to find details about these parks and trails. See the pullout map for locations (inside back cover). Beaver Hills Biodiversity Trail - The trail is located at Range Road 211 and Township Road 530 (Baseline Road), on the east side of the Strathcona Wilderness Centre. The trail is 2 km long with benches, lookout points and a picnic area at the trail head. Northwest Bruderheim Natural Area includes over 600 acres in 2 locations, west of Highway 830 on Twp Rd 562, north on Rg Rd 211. Both locations will allow you to discover the beauty of the natural landscape. Discover the trails and walk along the banks of Beaverhill Creek to see an amazing array of wildflowers. Enjoy the many activities—mushroom and berry picking, hiking, bird and wildlife watching, horseback riding and cross-country skiing. The Strathcona Wilderness Centre is a four-season outdoor adventure centre, with 12 km of trails. Enjoy snowshoeing, crosscountry skiing, disc-golfing, hiking, wildlife watching, tent camping, picnicking, and more. The Wilderness Centre is located 16 km east of Sherwood Park and is open daily year round. In the winter you can rent complete x-country ski and snowshoe equipment for all ages. See ad page 80. White Earth Valley Natural Area is a 2055-hectare naturalist's gem. The 17 km White Earth Trail winds through a variety of rich habitats, with an abundance of diverse plants and wildlife. Hiking, wildlife viewing, horseback riding and geocaching are just some of the activities that your family will encounter. It is accessible from adjacent Long Lake Provincial Park during the operating season, with year-round access from Township Road 621. MAJOR ATTRACTION Less than 35 minutes east of Edmonton lies a year-round oasis where bison roam freely, sun glistens off lakes and ponds, and stars light-up the night sky; Elk Island National Park. This gentle wilderness of aspen woodlands, prairie meadows and pockets of wetland is a wildlife-watchers paradise; free roaming bison, elk, deer, moose, and more than 250 bird species call this place home. A short drive to Elk Island National Park rewards visitors with countless recreation opportunities; hike or bike over 80 km of trails, rent canoes and paddle around the islands on Astotin Lake, take in a free program, or borrow a geocaching kit and enjoy a nearly 200 square kilometre scavenger hunt. Fun doesn't end as the sun begins to set; stay warm by a fire and look into a sky filled with stars and dancing Northern Lights. Without the glow of city lights around you'll see more than you knew existed! With so much to do why not stay the night? Book a campsite and bring your tent or RV to the Astotin Lake Campground, or pack a backpack and make the 4 km hike into Oster Lake Backcountry Campground. If you want the experience of camping but need a few more creature comforts, oTENTik's are available at Elk Island! oTENTikâ&#x20AC;&#x2122;s are a cross between a tent and a rustic cabin; bring a sleeping bag and discover the joys of camping without any fuss. New for 2019: Renovations to the Elk Island National Park Visitor Centre and Gift Shop are almost complete: the completely redesigned space will be open to the public in May 2019. Be sure to stop and visit the brand new Elk Island National Park Visitor Information Centre and Gift Shop! East of Edmonton has some of Albertaâ&#x20AC;&#x2122;s best wildlife viewing opportunities. Look for over 250 species of birds, such as herons, pelicans and bald eagles; also bears, beavers, bison, moose, elk, deer and more! JUBILEE REGIONAL PARK (Lea Park Campground). 2 camping cabins. Marwayne. 780-847-2273. ELK ISLAND NATIONAL PARK OTENTIKS – 5 oTENTiks. (an A-Frame tent & cabin in one). 1-877-737-3783. LAKESHORE INN BED & BREAKFAST Cold Lake. STRATHCONA WILDERNESS CENTRE – The Lodge is available for SIR WINSTON CHURCHILL PROVINCIAL PARK Alberta's only Island park offers 15 lakefront cabins and two tipis. Lac La Biche. 780-623-4144.
retreat or group bookings, complete with kitchen, dining room and meeting facilities.780-922-3939. FOOTLOOSE CABOOSE LODGE Luxuriously appointed railroad caboose. Tofield. 780-662-2372. MIQUELON PROVINCIAL PARK 4 Yurts. N of Camrose. 780-672-7274. For a truly unique experience Rocky Meadows Country-Getaway, and Canadian Bighorn Resort, both north of Bonnyville, offer an exceptional getaway experience! Rocky Meadows Country-Getaway is much more than just a campground. You can have some fun playing a round of mini-golf with the family, or try your hand at paintball, and be sure to pick some in-season berries to take home with you. This unique getaway is 13 km north of Bonnyville on Highway 41, just south of La Corey. Heading north of La Corey, surrounded by boreal forest is Canadian Bighorn Resort. Their mission is to create a wilderness experience where guests are able to escape the stress and pressures of everyday life, and experience fun, adventure and rejuvenation. Need we say more? Book your getaway today! Rocky Meadows Country-Getaway Campground open year-round. CANADIAN BIGHORN RESORT 2 Rustic Style Cabins, Common Area Lodge, Glamping Units, and RV Sites set on a Bighorn Sheep Ranch. Hiking, ATV Trails, Fishing Pond, Wildlife Viewing and more! Canadian Bighorn Resort Rustic Style Cabins open year-round. Just 3 minutes east of Kinosoo beach you will enjoy the tranquility throughout the 142 acres at Morning Star Retreats. Here you will not only take a load off and relax, you will also reconnect with yourself and nature in a very comforting, and natural setting. On the southside of Cold Lake at Cherry Grove you will find a pure woodland oasis. Hamilton House B&B features a private lake where you can soak up the Hamilton House Fishing Charter sun on your own private beach, or take in the fresh air and relax in an outdoor hot tub. They also have hiking and biking trails to enjoy, and can even take you on a fishing charter. These unique stays are excited to welcome you! Only 2 hrs east of Edmonton! • Westcove at Vincent Lake 780-645-6688 All with Power Sites and excellent Facilities. The Best 9 hole course around! 1 km NW of intersection Hwy 28 & 855 PRO SHOP 780-656-2121 Premier 9-hole Course, par 36 Practice Facilities Carts & Club Rentals Available Licensed Dining Room & Patio 14 full service RV Sites Stay & Play packages available! Valid with power cart rental, coupon applies to WEEKDAY GREEN FEES only. www.innisfree.ca Snowbirds Welcome • Reservations Required • Gated Community • Winter Storage A quiet RV Park for people over 50 in a beautiful country location with seasonal, monthly & weekly rates. 107 Fully Serviced Sites located on the Camrose Regional Exhibition Grounds adjacent to Camrose Resort Casino. "The Resort of Northeast Alberta"
Nestled on the north end of the Village, next to ball diamonds and the arena. 30 (P/W/S) sites, 20 (P) sites, large overflow area. Showers, washrooms & dump station. Sites are booked on a first come first serve basis. 60 Fully Serviced Sites Power, (30 AMP Breakers) Water and Sewer (21 Sites Year Round Hook-ups) (27 Sites with Shade Trees, Overﬂow: 33 Gravel Sites) • Fenced on all Sides with Exit and Enter Driveways • 3 Coin Operated Showers: 1 Shower, 1 Sink, 1 Toilet in each • 3 Commercial Coin Operated Washers and Dryers • Easy Access to Highway 16 and 881 • Close Proximity to: UFA Fuel, Confectionery, Liquor Store, Grocery Store and 2 Banks. Find detailed information about these colour coded Road Trips throughout this Travel Guide. Locations are approximate. Map not to scale. 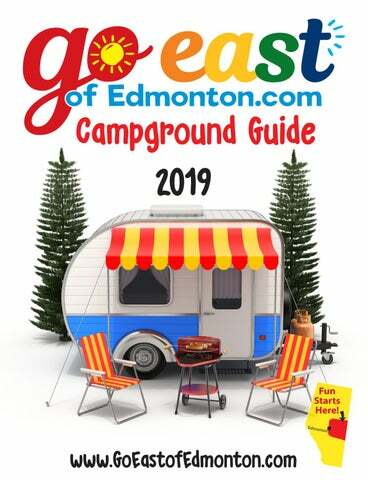 THE ONLINE GUIDE This magazine is the #1 most comprehensive travel guide to the region with everything to see and do East, Northeast and Southeast of Edmonton. FOR OUR MONTHLY E-NEWSLETTER Learn about special promotions, events and what’s new!